If the countless rumors, leaks and the video that was leaked 3 weeks ago weren’t good enough to support the fact that HTC M8 exists, there is another hands on video of the HTC M8 that was uploaded on YouTube today. This time the video detailed and showed us a good look of the phone design and the new HTC Sense UI 6. The video is 15 minutes long but we couldn’t get a lot out of the video as the guy who was reviewing HTC M8 was talking in German. 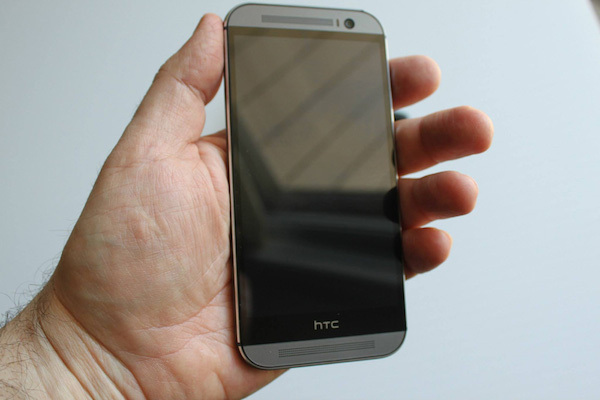 The color of the phone is slate grey that is amongst one of the rumored colors that the HTC M8 will come in. The brushed aluminum that is used on the phone is shinier than its predecessor HTC One. The phone is more rounded now which will help for a better grip but the phone has lost its sleek design and looks fat and heavier than the HTC One. The edges of the phone are now surrounded by a chrome type layer the same you see on the edges of iPhone 5S giving it a more premium look. The Home and the Back key have been moved on to the 5 inch screen now and what we did not like about the phone was that the HTC logo is taking up too much space making the phone larger than it should be. HTC M8 is rumored to have a 5 inch display supporting a resolution of 1920 x 1080, Qualcomm Snapdragon 801 processor clocked at 2.3 GHz, 3GB of RAM, two cameras at the back and a single camera on the front, HTC Sense 6, Android Kitkat 4.4.2. There were also some leaked screen shots seen on the internet based on Basemark benchmark placing the phone on the top of all 2014 flagship smartphones from every manufacturer. HTC is going to introduce their 2014 flagship smartphone tomorrow at 11AM ET in NYC and we will finally get to see what HTC has in store for us in the form of HTC M8.